Prototype finished and working. Miniaturisation of circuits currently being done. (Hardware) – 2011 – present. 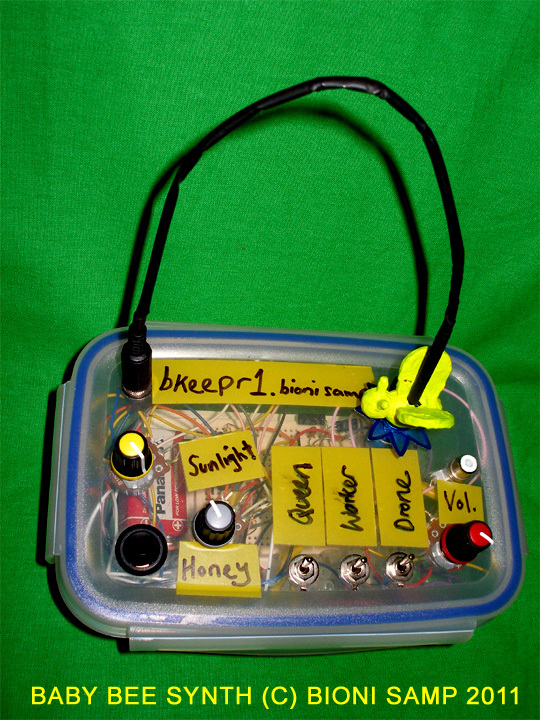 The Baby Bee Synth (Bkeepr2) (Small hardware synthesiser) – 2011 is a electronic musical instrument which emanates bee frequencies. Prototype for larger Hive Synthesiser. Three oscillator synth works by flying the bee into the flower. The bee has a LED light in it and the flower has a LDR Light Dependent Resistor, affecting the oscillators frequencies. When slowed right down in tempo it sounds like a crude drum machine.